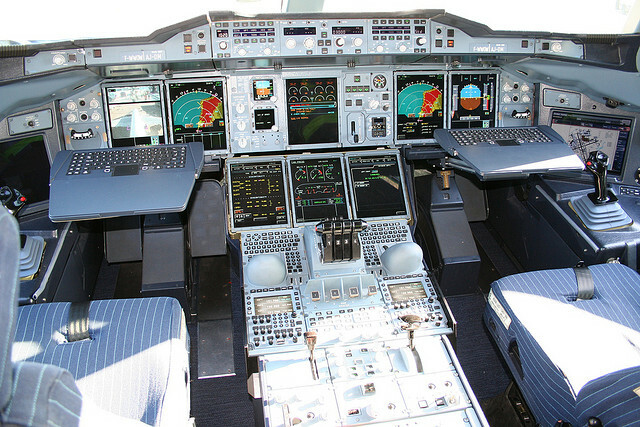 UTC Aerospace Systems is introducing the world’s first active side-stick controller for large commercial aircraft. UTC Aerospace Systems is a unit of United Technologies Corp.
UTC Aerospace Systems’ Actuation & Propeller business unit is supplying the active side-sticks for the cockpit of the new Irkut MC-21 single aisle aircraft. The MC-21 family of aircraft will include two versions ranging from 150 to 212 seats. The MC-21-300 is scheduled to achieve its first flight next year and enter into service in 2018. Active side-sticks provide pilots with a tactile and visual feedback of the aircraft behavior. Featuring an electrical cross coupling (with override capability) and a grip backdrive in auto-pilot mode, the active controllers have been designed to provide pilots with a heightened awareness of the aircraft’s situation. Active side-sticks, which are already in use in aviation industry, are a new development for large commercial aircraft. “The development of the active technology for large commercial aircraft constitutes an engineering breakthrough offering new features to pilots and wider opportunities for the aerospace industry,” said Arnaud Delpeuch , program manager for Actuation & Propeller Systems. The performance of the new active side-sticks was well-received by Irkut test pilots during a series of trial runs in Figeac, France . “Active side-sticks significantly improve the level of safety, making evident control inputs of pilots to one another and allowing prompt recovery actions,” said Roman Taskaev , Yakovlev Deputy General Director for Flight Tests and chief test pilot for the MC-21 program. A side-stick or sidestick controller is an aircraft control column (or joystick) that is located on the side console of the pilot, usually on the righthand side, or outboard on a two-seat flightdeck. Typically this is found in aircraft that are equipped with fly-by-wire control systems. The throttle controls are typically located to the left of the pilot (or centrally on a two-seat flightdeck). Only one hand may thus be used for the stick, and both-hands operation is neither possible nor required. The side-stick is used in many modern military fighter aircraft, such as the F-16 Fighting Falcon, Mitsubishi F-2, Dassault Rafale, and F-22 Raptor, and also on civil aircraft, such as the Sukhoi Superjet 100, Airbus A320 and later Airbus aircraft, including the largest passenger jet in service, the Airbus A380. This arrangement contrasts with the more conventional design where the stick is located in the centre of the cockpit between the pilot’s legs, called a “centre stick”.